Instead of inviting your team members one by one, you can upload a CSV (comma separated value) file instead. You can either 1) download our template from the "People" page, or 2) create a template from scratch. This CSV can contain a part or your entire company's organization. We will do this by matching on each user's email. Because of this, please make sure all emails are correct before uploading your CSV file. If you're an admin the CSV upload feature can be found on your Admin panel. The "Manager Email" and "Status" columns are a bit special. "Manager Email" will be used to configure your org chart and reporting structure. Again, please make sure these emails are correct as managers have special permissions around managing their team. 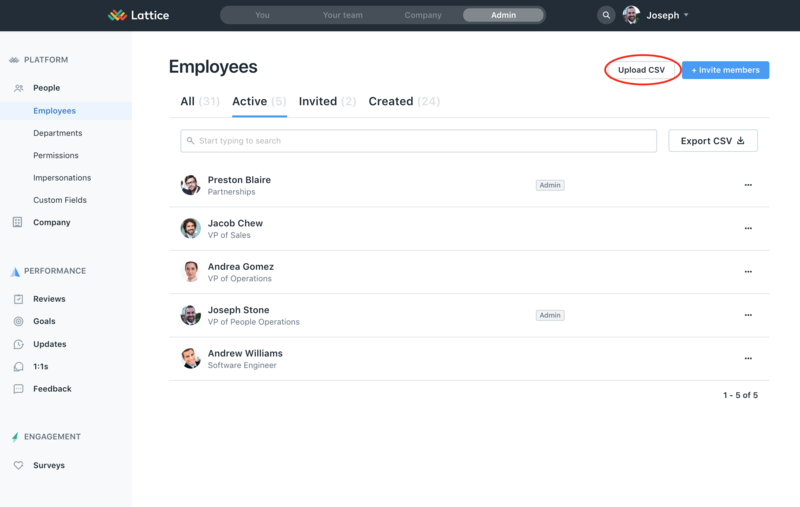 "Status" on the other hand can be used to deactivate Lattice accounts after an employee has been terminated. The column can be set to either "active" or "terminated". Once the CSV is uploaded, the users will remain in a "Created" state. They can be invited all at once or one at a time. Learn more here!